Flexible configurations of this reader provide the capability to read flat, U, or V-bottom microplates, as well as 8- or 12-well strip plates. It boasts single or dual wavelength detection and a variable speed plate shaking capability. Superior onboard software provides user log-in, plenty of room for protocols and data storage, and sufficient curve-fit and reporting functions. 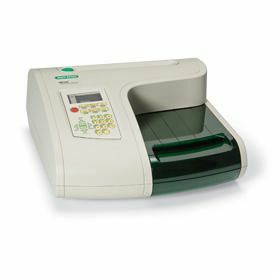 Additional features include an easy access 8-position filter disk with four standard filters provided, integrated thermal printer, and a USB2 port for external PC control. The reader comes with Microplate Manager® software for powerful, versatile colorimetric and turbidimetric analyses as well as report analysis for raw data, absorbance, limit, matrix, normalization, and curve fit.